One stop solution for all your biology questions! Got a question? Ask us here! 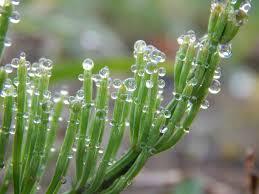 Although large quantities of water are absorbed by the plant from the soil only a small amount of it is utilized. The excess of water is lost from the aerial parts of plants in the form of water vapours. This is called transpiration. Most of the transpiration takes place through stomata. Stomata are usually confined in more numbers on the lower sides of the leaves. In monocots. Eg. Grasses they are equally distributed on both sides. While in aquatic plants with floating leaves they are present on the upper surface. The cuticle is impervious to water, even though, some water may be lost through it. It may contribute a maximum of about 10% of the total transpiration. Some water may be lost by woody stems through lenticels which are called as lenticular transpiration. The mechanism of stomatal transpiration which takes place during the daytime can be studied in three steps. i. Osmotic diffusion of water in the leaf from xylem to intercellular space above the stomata through the mesophyll cells. iii. Simple diffusion of water vapours from intercellular spaces to another atmosphere through stomata. When mesophyll cells draw water from the xylem they become turgid and their diffusion pressure deficit (DPD) and osmotic pressure (OP) decreases with the result that they release water in the form of vapour in intercellular spaces close to stomata by osmotic diffusion. Now, in turn, the O.P and D.P.D of mesophyll cells become higher and hence, they draw water from xylem by osmotic diffusion. The stomata are easily recognized from the surrounding epidermal cells by their peculiar shape. The epidermal cells that immediately surround the stomata may be similar to other epidermal cells or may be different and specialized. In the latter case, they are called as subsidiary cells. The guard cells differ from other epidermal cells also in containing chloroplasts and peculiar thickening on their adjacent surface (in closed stomata) or on surfaces. Consequent to an increase in the osmotic pressure (OP) and diffusion pressure deficit (DPD) of the guard cells (which is due to accumulation of osmotically active substances), osmotic diffusion of water from surrounding epidermal cells and mesophyll cells into guard cells follows. This increase the turgor pressure (TP) of the guard cells and they become turgid. The guard cells swell, increase in length and their adjacent thickened surfaces starch forming a pore and thus the stomata open. On the other hand, when OP and DPD of guard cells decrease (due to depletion of osmotically active substances) relative to surrounding epidermal and mesophyll cells, water is released back into the latter by osmotic diffusion and the guard cells become flaccid. The thickened surfaces of the guard cells come close to each other, thereby closing the stomatal pore and stomata. Osmotic diffusion of water into guard cells occur when their osmotic pressure increases and water potential decreases (i.e become more negative) related to those of surrounding epidermal and mesophyll cells. The guard cells become flaccid when their osmotic pressure decreases relative to the surrounding cells (Movement of water takes place from a region of higher water potential to a region of lower water potential. These may be several different agents or mechanisms which control stomatal movements. The active pumping of K+ ions in the guard. This classical theory is based on the effect of pH on starch phosphorylase enzyme which reversibly catalyses the conversion of starch + inorganic phosphate into glucose -1 phosphate. During the day, pH is guard cells in high. This favours hydrolysis of starch (which is insoluble in glucose -1- phosphate (which is soluble) so that osmotic pressure is increased in guard cells. Consequently, water enters, into the guard cells by osmotic diffusion from the surrounding epidermal and mesophyll cells. Guard cells become turgid and the stomata open. During dark, reverse process occurs. 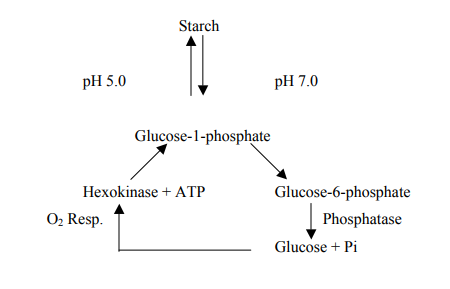 Glucose 1- phosphate is converted back into starch in the guard cells thereby decreasing osmotic pressure. The guard cell release water, become flaccid and stomata become closed. According to Steward 91964), the conversion of starch and inorganic phosphate into glucose-1-phosphate does not cause any appreciable change in the osmotic pressure because the inorganic phosphate and glucose-1-phosphate are equally active osmotically. Glucose-1-phosphate should be further converted into glucose and inorganic phosphate for the opening of stomata. Metabolic energy in the form of ATP would be required for the closing of stomata which probably comes through respiration. During daylight photosynthesis occurs in guard cells as they contain chloroplast. The soluble sugars formed in this process may contribute to increasing the osmotic potential of guard cells and hence resulting in stomatal opening. However, very small amounts of soluble sugars (osmotically active) have been extracted from the guard cells which are insufficient to affect water potential. According to this mechanism, there is accumulation of K+ ions in the guard cells during daylight period. The protons (H+) are ‘pumped out’ from the guard cells into the adjacent epidermal cells and in exchange K+ ions are mediated through ATP and thus are an active process. ATP is generated in non-cyclic photophosphorylation in photosynthesis in the guard cells. The ATP required in ion exchange process may also come through respiration. The accumulation of K ion is sufficient enough to significantly decrease the water potential of guard cells during day light. 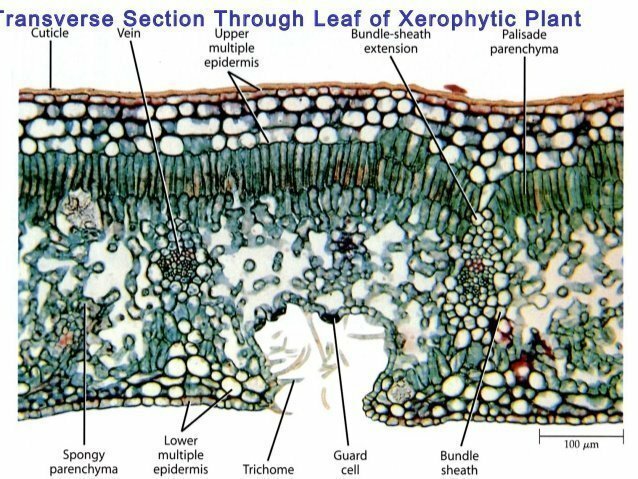 Consequently, water enters into them from the adjacent epidermal and mesophyll cells thereby increasing their turgor pressure and opening the stomatal pore. Reverse situation prevails during dark when stomata are closed. There is no accumulation of ‘K’ in g cells in dark. The last step in the mechanism of transpiration is the simple diffusion of water vapours from the intercellular spaces to the atmosphere through open stomata. This is because the intercellular spaces are more saturated with moisture is comparison to the outer atmosphere in the vicinity of stomata. Plants waste much of their energy in absorbing large quantities of water and most of which is ultimately lost through transpiration. Some people thin that – Transpiration as advantageous to plant. Role of movement of water Plays an important role in upward movement of water i.e Ascent of sap in plants. Role in absorption and translocation of mineral salts Absorption of water and mineral salts are an entirely independent process. Therefore transpiration has nothing to do with the absorption of mineral salts. 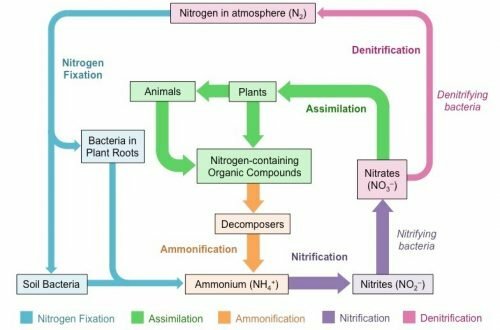 However, once mineral salts have been absorbed by the plants, their further translocation and distribution may be facilitated by transpiration through translocation of water in the xylem elements. Role of regulation of temperature Some light energy absorbed by the leaves is utilized in photosynthesis; rest is converted into heat energy which raises their temperature. Transpiration plays an important role in controlling the temperature of the plants. Rapid evaporation of water from the aerial parts of the plant through transpiration brings down their temperature and thus prevents them from excessive heating. Many xerophytes have to develop structural modification and adaptation to check transpiration. Deciduous trees have to shed their leaves during autumn to check loss of water. But, in spite of the various disadvantages, the plants cannot avoid transpiration due to their peculiar internal structure particularly those of leaves. Their internal structure although basically means for gaseous exchange for respiration, P.S. etc. is such that it cannot check the evaporation of water. Therefore, many workers like Curtis (1926) have called transpiration as the necessary evil. In a humid atmosphere, (when relative humidity) is high), the rate of transpiration decreases. It is because the atmosphere is more saturated with moisture and retards the diffusion of water vapour from the intercellular spaces of the leaves to the outer atmosphere through stomata. In a dry atmosphere, the RH is low and the air is not saturated with moisture and hence, the rate of transpiration increases. When the wind is blowing gently, the rate of transpiration increases because it removes moisture from the vicinity of the transpiration parts of the plant thus facilitating the diffusion of water vapour from the intercellular spaces of the leaves to the outer atmosphere through stomata. When the wind is blowing violently, the rate of transpiration decreased because it creates hindrance in the outward diffusion of water vapours from the transpiring part and it may also close the stomata. 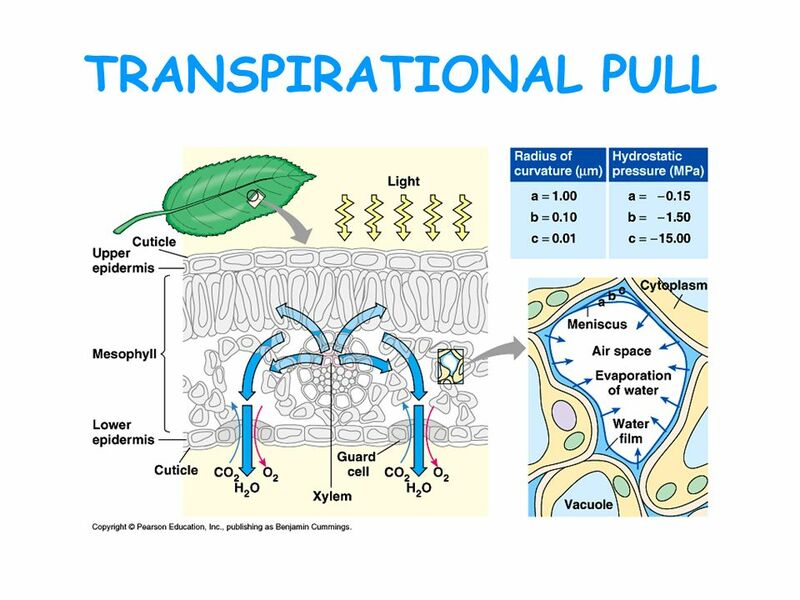 Light increases the rate of transpiration because In light stomata open; It increases the temperature. In dark, due to closure of stomata, the stomatal transpiration is almost stopped. Rate of transpiration will decrease if there is not enough water in the soil in such from which can be easily absorbed by the roots. An increase in CO2 concentration in the atmosphere (Ova the usual concentration) more so inside the leaf, leads towards stomatal closure and hence it retards transpiration. It is very essential for transpiration. Deficiency of water in the plants will result in a decrease of transpiration rate. Increase rate of transpiration containing for longer periods often creates internal water deficit in plants because absorption of water does not keep pace with it. The number, size, position and the movement of stomata affect the rate of transpiration. In dark stomata are closed and stomatal transpiration is checked. Sunken stomata help in reducing the rate of stomatal transpiration. In xerophytes, the leaves are reduced in size or may even fall to check transpiration. Thick cuticle on the presence of a wax coating on exposed parts reduces cuticles transpiration. A number of substances are known which when applied to the plants retard their transpiration. Such substances are called as antitranspirants. Some examples of antitranspirants are colourless plastics, silicone, oils, low viscosity waxes, phenylmercuric acetate, abscisic acid, CO2, etc. Colourless plastic, silicone oils and low viscosity waxes belong to one group as these are sprayed on the leaves, form after film which is permeable to O2 and CO2 but not to water. exercised a very little toxic effect on leaves and resulted in partial closure of stomatal pores for a period of two weeks. Similarly ABA a plant hormone also induces stomatal closure. CO2 is an effective antitranspirant. A little rise in CO2 concentration from the natural 0.03% to 0.05% induces partial closure of stomata. Its higher concentration cannot be used which results in complete closure of stomata affecting adversely the photosynthesis and respiration. In some plants such as garden nasturtium, tomato, colocasia etc, water drops ooze out from the uninjured margins of the leaves where the main vein ends. This is called as guttation and takes place usually early in the morning when the rate of absorption and root pressure are high while the transpiration is very low. The phenomenon of guttation is associated with the presence of special types of stomata at the margins of the leaves which are called as water stomata or hydathodes. Each hydathode consists of a water pore which remains permanently open. Below this, there is a small cavity followed by a loose tissue called epithem. This epithet is in close association with the ends of the vascular elements of veins. Under high root pressure, the water is given to the epithem by the xylem of the veins. From epithem, water is released into the cavity. When this cavity is completely filled with water solution, the later begins to ooze out in the form of water drops through the water pore.